Hi-Five is an American R&B quintet based out of Waco, Texas who had a string of Top 5 hits in the early and mid 1990s, including the Billboard Hot 100 number one single "I Like The Way (The Kissing Game)". The group, which was formed in 1990, consisted of Tony Thompson, Roderick "Pooh" Clark, Marcus Sanders, Russell Neal, and Toriano Easley. Easley was later replaced by Treston Irby. Hi-Five was signed to Jive Records and released their first album, Hi-Five, in 1990. Hi-Five was signed to Jive Records and released their first album, Hi-Five, in 1990. 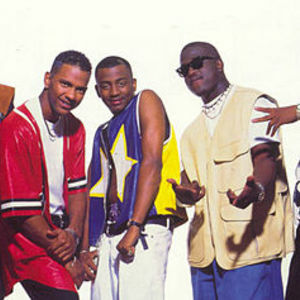 The album went multi-platinum and was produced by award-winning hitmaker Teddy Riley; it included such singles as "I Just Can't Handle It", "I Can't Wait Another Minute", and their biggest hit to date, "I Like The Way (The Kissing Game)", which went to #1 on the Billboard Hot 100 and the Billboard R&B chart. The group enjoyed mainstream success and received comparisons to many of their R&B counterparts, namely New Edition. Hi-Five's second LP, Keep It Goin' On, came out in 1992. Though not as successful as their debut effort, several tracks from this album, including "She's Playing Hard To Get" and the R. Kelly-penned "Quality Time" got major airplay. Shortly after this album was released, Roderick "Pooh" Clark was involved in a near-fatal automobile accident. In 1993, Hi-Five emerged with a third album, Faithful, which featured the songs "Unconditional Love" and "Never Should Have Let You Go". After Hi-Five disbanded around 1994, Thompson released a solo album, Sexsational. He scored a minor hit with "I Wanna Love Like That". In 2005, Thompson re-incarnated Hi-Five with four new members, one of whom is his younger brother, Jordan. Their new album The Return was released in 2006 on Thompson's independent label, N'Depth. Unfortunately, on June 1st, 2007, the lead singer Tony Thompson passed away in his hometown of Waco, TX. During this time, Tony Thompson was working on a reunion. Tony's vision is now coming to fruition with the leadership of long-time friend and band mate, "Trus" (Treston Irby) who has retooled Hi-Five to preserve the signature 90's sound and create new music for listeners born in the 90's. They are now in the studio and preparing to drop a new album on Irby's Bronx Most Wanted label.